Top or Down the Street? 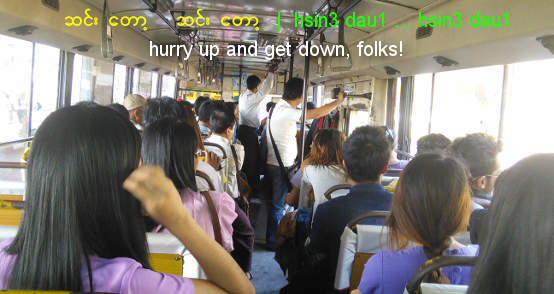 Unlike English or Mandarin Chinese speakers, people in Yangon don't often use North, East, South, West to tell directions. For example, If I tell the taxi driver to go to the 46th Street in downtown Yangon, the driver will ask, a-pau2 lun3 la3 (top of the street ?) or out lun3 la3 (down the street? ), where a-pau2, meaning "on top" refers to North and out meaning "under" refers to the South. On the other hand, people in Mandalay speak of the left side of the body as myout (North), and right side of the body as toun2 (south). So, when the doctor asks the patient which side hurts, the patient will reply either "North" or "South". a-pau2 htut tet ja1 zo1 Let's go upstairs. a-pau2 htut tet yah1 meare2 need to go upstairs. a-pyin2 htwet thwa3 deare2 xxxx went out. a-pyin2 thwa3 meare2 I am going out. hsin3 meare2 I'm going down. ka3 pau2 tet go inside the car! lite ma1 la3 Are you coming along? ma1 weare2 thay3 bu3 not buying this time. teare1 teare1 hsoat back up straight! xxxx beare3 pay3 ba2 Pay me only xxxx. xxxx leare3 ma1 la3 Want to exchange xxxx? xxxx loat ba2 Please make it xxxx. So far, we have been building up on the basic Burmese sentence constructions and learning some Burmese culture along the way. You will not be speaking true Burmese if you attempt to make a direct translation from an another language using a dictionary. Deep inside each of us, there are universal human feelings, emotions, wants, needs, likes and dislikes. Those primary direct experiences from the within seem to exist even if we don't use any words to describe them. We use language to code and decode those fundamentals so that we can communicate with the others. After coding those "inner feelings" into words, however, the direct translation of words into an another language using a dictionary doesn't always fully capture the original "inner experiences" that we would like to articulate. Why? Maybe that's because our usage of the words depends on how we see the world, our attitudes, how we relate to each other, our way of life and daily activities, the weather and the environment, what we consider as appropriate or inappropriate, important or not important; and they are different from culture to culture. When a neighbor greets me: beare2 leare3 -- Go where? (where + ? ), I doubt that he is really interested in where I am going, just like when you say "How are you? ", you say it without thinking too deeply about the state of well-being of the other person. But, there is something more fundamental -- that "inner feeling" and "intention" behind that greeting. Here, you want to express your friendliness, and also to some degree you feel awkward if you don't say something that the society expects you to say. Since this is the case, the two greetings are equivalent in terms of "inner feelings". That is why I have been using two translations side by side: "inner feeling" as well as direct translation word by word so that you can grasp both the overall feeling tone and meaning of each word in the sentence. So, now beare2 leare3 -- Where to? This interesting video clip suggests some exciting places to go -- places so fun-filled and thrilling that had the late Michael Jackson, the king of pop known about those places, he would have brought his throne over to Myanmar and taken the front row. The phrase starts with the name of the place and ends with thwa3 meare2 -- will go. Another word you will recognize is the word "hote" meaning "yes", but in this case, it is used as a question: "Isn't it?" teare1-teare1 hsoat ... teare1-teare1 hsoat -- Parking attendant telling the driver to back up straight. Myanmar Grammar Notes: Myanmar-English dictionary by the Myanmar Language Commission defines ho3! as an interjection. However, it should be noted that it can also be a single word command similar to thwa3 - Go! In colloquial Burmese, people often use it as a verb. For example, very common phrase ho3-hta3 is used to tell the driver to stop there and not to release the brakes. ka3 pau2 tet -- Go inside the car! (car + on top + climb) No, it doesn't mean go up the roof of the car! In the old days, people used to go up the cart pulled by two bullocks; there is no "inside" of the cart to speak of. Note: Extreme position is spelled "hsone3". For some words, it is pronounced "zone3". Why doubling and repeating words? Probably because of the noise level in the busy city center, words need to be repeated to be heard. In comparison, in Bahasa Malaysia or Indonesia, words are repeated to make them plural. For example, "Orang, orang" for people where "orang" stands for a single man in Malay/Indonesian language. In Mandarin Chinese, words are sometimes doubled up for different reasons. "Ke3 yi.. Ke3 yi" to stress from "can" to a more enthusiastic "Of course, you can.."
hma2 is a Burmese counterpart of the postpositional marker "Zai4" in Mandarin Chinese. English equivalent words are the prepositions "at", "in", "on", etc.. hteare3 from the word a-hteare3 meaning "inside" is used as suffix to nouns. It is a postpositional marker in Burmese grammar as well. hsa1-ya2 beare2 thwa3 ma1 leare3 -- Where are you going, Sir? hsu3-lay2 lite ma1 la3 -- Sule Pagoda, are you going? Note: Sometimes taxi drivers may refuse to go to routes that are not profitable. If he takes the passenger to the remote part of the Greater Yangon City, he may not find an another passenger on his way back to the busy part of the town. So,"lite" is like saying, "That's where I am heading. Are you coming along?" 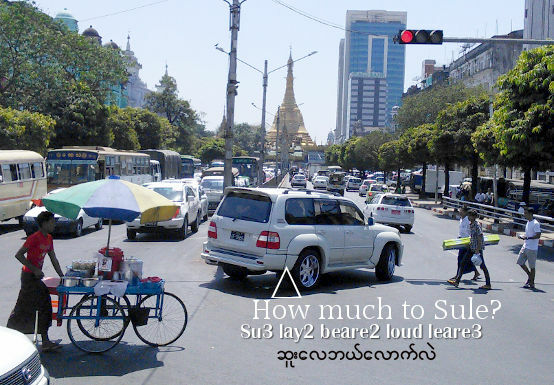 hsu3-lay2 beare2-lout leare3 : "How much to Sule?" thone3 htoun2 beare3 pay3 ba2 -- Pay me only 3,000.
ha2... thone3 htoun2 mya3 deare2 -- C'mon... 3,000 is too much. hna1 htoun2 loat ba2 -- Please make it 2,000. The Toyota taxi (recently imported new model) is modified to run by Compressed Natural Gas (CNG). After about 15 minutes drive, the taxi stops in front of the parking lot near Sule Pagoda. 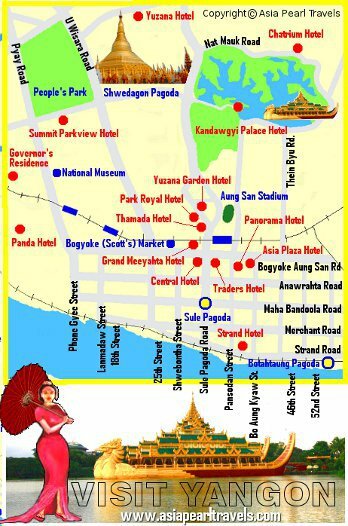 The tourist had studied the map of down-town Yangon the night before, but now he is a bit confused as to which road around the Sule Pagoda he should be heading. He decides to ask for direction with his recently-acquired knowledge of Burmese language he learned from some Internet website. People in Yangon must be very friendly. Someone approaches to him first even before he asks for help. Let's see what this friendly Myanmar man has to say. hsa1-ya2-ji3, dau2-la2 leare3 ma1 la3 -- "Do you want to exchange dollar, big master? ", the man in traditional lone2 ji2 (sarong) asks the tourist. The tourist has never heard of this kind of greeting before. He decides that he will exchange a conversation with this friendly Burmese man. Nearby street vendor quickly takes advantage of the fact that the tourist can speak a pretty good Burmese, with the right tone and all. a-khway2 -- tapes, VCD, DVD etc. a-khway2 dway2 kji1 ba2 ome3 -- "Won't you watch movies?" The street vendor helds up a transparent plastic VCD cover with interesting color print inside. ta1-khway2 nga3 ya2 ba2 -- "500 kyat each", he says in a salesman pitch. ma1 weare2 thay3 bu3 -- Not buying this time! The Adventure of the tourist continues in lesson 6. June 2012 update: You will be seeing less and less of street-vendors in downtown yangon. Commercial banks have now replaced the illegal money exchangers of the past. You can use ATM to withdraw local currency in Kyats if you have foreign-issued credit or debit cards with Visa and MasterCard Networks. The new civilian government has started to clean up the congested side-walks in the streets of downtown Yangon. New shops and buildings are slowly replacing the old. You will now see luxury vehicles on the road after import permits were issued in September 2011. March 2014 update: The above photo with Sule Pagoda in the background was added. 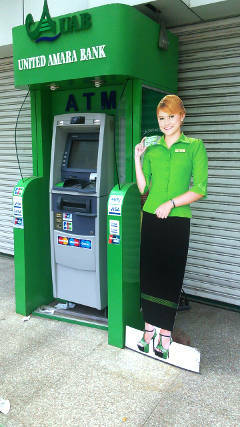 May 2015 update: This photo of United Amara Bank ATM machine at Bargayar Street, Myaynigone, Yangon. January 2016 update: Street vendors are back due to lack of enforcement. Expect traffic jams in day time. January 2017 update: On January 16, 2017 a new bus system with new numbers were introduced in Yangon. Air-conditioned new buses imported from China are now abailable in some routes.See the routes with all the bus stops and detailed maps at https://ygnbuses.com.